So today was my 4th lesson with Beth Mattei-Miller of First Class Canine to help me work on some things with my newest guy Hugh. Hugh was definitely a great dog from the beginning but he needed some help with things that were way out of my league. And being that he is around 7 or 8 years old i really didn't think there was much i can do. Well I had Beth come in to try to help. I can't even begin to describe the difference. The progress i have seen is amazing. Especially after thinking correcting some of these things was hopeless.So if you have a dog regardless of how old and you really want to bring out the very best of your best friend give her a call. - Chris G.
"I just wanted to tell that that both myself and husband think you are WONDERFUL!! We have been doing everything you said from click and treating when not nipping to my husband aging with him in the mornings and Shane has been nearly incident free. Thanks again for everything!!!!" - Betty S.
"Kevin, Kevin, Kevin, I had some more dumb luck with the camera today - Three Times! We were outside working on the set up for her zip line. Anyway, I had promised not to be a pest and go all out Pug this and Pug that and I've been good. I just got lucky with the camera this past week and had to share. But, beware: inside that adorable little furry bundle of love there is a 17 pound household terrorist! It's true. Kevin is both a blessing and a curse but we have a fabulous trainer, First Class Canine from Pittston, PA. Kevin's "Auntie Beth" knows her stuff! It's amazing how quickly Kevin is learning her duties. I HIGHLY Recommend First Class Canine! " - Carolyn W.
"I can hardly believe the difference!! I know we still have work to do, and I think we will always have things to work on with Murphy, but he is worth the time and dedication! He is a completely different dog. I have to take a minute and be a proud Dog-mommy: my family came over today from out-of-town. 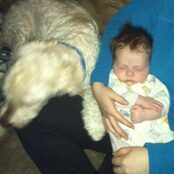 Murphy was having difficulty with multiple people over with the baby. I was a nervous wreck. Nick and I were here, along with my aunt, uncle, 2 cousins(all of which Murphy never met), my gram, dad, and sister. I let him greet them at the door and sniff/bark (his usual). I gave him his Bully stick and he laid down. Eventually he left it and was walking around like a "normal" dog. He was sitting nicely, enjoying being pet. He laid under the table while we ate. People passed Dayne around and he didn't do anything. I was in complete shock!! For 2.5 hrs of the visit he was amazing!! Back in January when I cried daily envisioning re-homing him, I could only dream of this. THANK YOU so much!" 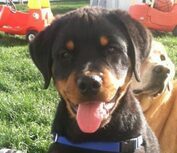 - Jennifer W.
"First Class Canine was essential in helping to bring out the best in my rescue dog. 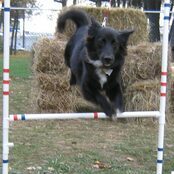 Sam, my border collie/sheltie mix definitely had some evidence of abuse in the past and needed the right trainer. Beth @ First Class Canine knew exactly how to bring his active mind out of it shell. Her gentle training methods were the perfect remedy . Sam has greatly improved since I first got him . 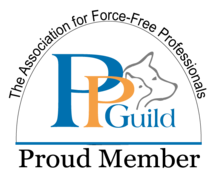 The shaping class is invaluable to learn just about any behavior you want. Sam even learned to bowl! I would recommend First Class Canine to anyone." 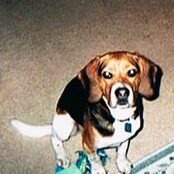 - Liza R.
"I don't know much about Bailey's first year as a Beagle puppy. He was spending his days at a no-kill shelter when we met. He was already a little over a year old, but still very much a pup. His previous owner could no longer keep him due to a change in living arrangements. Although Bailey was still quite 'rough around the edges' with his social skills and apparently somewhat anxious- he possessed a sweet and joyful nature. I took him home. He became an inseperable part of my family. Although he was quick to learn some basic manners, I soon realized I needed some help with a couple of his more complicated issues. Since he already seemed to have some problems with being fearful-- I wanted to be careful to find someone whose training approach was not the typical chain choke collar and regimented cirriculum. He needed a 'Montessouri' school for dogs- Where he could actually discover a better behavior to replace the one that is problematic in a non-threatening manner. That's First Class Canine! Through a positive re-inforcement/ rewards approach, Bailey has been gently guided into a better balanced dog. At FCC we recieved one-on-one intsructions and the benefit of being in a group setting. I'm happy to say that he is well on his way to feeling good about himself -as all dogs should. He is still a work in progress but I have a better handle on how to help him reach his full potential. Many thanks to First Class Canine. P.S. It's alot of fun too!" 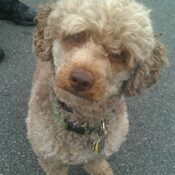 - Julie H.
"Jack is a mini-poodle, but can pull like a sled dog! We are in Manners II, and while Jack is very happy to pick up on clever tasks or tricks, he has never really wanted to walk nicely on a leash. We attended a fun day of doggie games and events in Bloomsburg a month ago, and one event was to have the dog walk nicely on a leash while the person carries a glass of water in the leash hand. Needless to say, I got a bath. At class, we continued to work on this, and Jack is greatly improved. These are two cell phone videos taken by me while walking Jack in town today. One shows how Jack is next to me instead of in front of me, the view is looking down at him. The other shows him on the other side of me, walking near the curb, not lunging out to pick up stuff on the street, and the shadow of me next to him with a very loose leash." - Heidi V.
Kiba's journey was a very interesting one. Fostered by a volunteer at a local animal shelter after this dog was returned due to a bite, we were called to help them out. Before Kiba ended up in a shelter the first time, Kiba was tied outside 24/7 for we can assume is a LARGE part of his 7 year life. 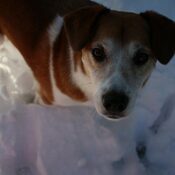 Kiba was leash reactive, hand shy and had some problem adjusting to other dogs in the home. Here is what her human family had to say about their journey. "Thank you for everything you helped us with. 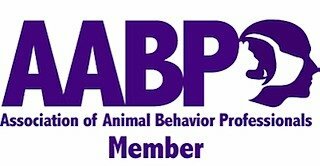 It helped us settle Kiba into becoming a permanent member of our family. There are no words that can adequately thank you for that!" - Jen W.